Chris has more than eight years of professional work experience in the field of human resources, including recruiting, selection, performance management, compensation and benefits administration, and employee training/development. That professional experience has come through employment with such varied organizations as the United States Senate, Kelly Services, and the Society for Human Resource Management (SHRM). He has been a certified Professional in Human Resources (PHR) through the HR Certification Institute since 2009. 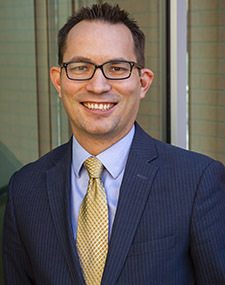 Chris received his Ph.D. in Organizational Behavior and Human Resource Management in 2015 from the Krannert School of Management at Purdue University. His research interests include employee selection, performance management, social media in the workplace, employee development, and leadership. Chris has taught university courses in Human Resource Management, Compensation and Benefits, Talent Acquisition and Retention, Management, and Organizational Behavior. He has also taught various applied business and management courses to professionals from various companies, including Proctor & Gamble, Malt-O-Meal, Pepperidge Farms, and RR Donnelley. Outside of his professional pursuits, Chris enjoys playing and watching sports (Go Nats! ), writing music, and spending time with his wife and three children. Levashina, J., Hartwell, C., Morgeson, F.P, Campion, M.A, (2014). The structured employment interview: Narrative and quantitative review of the research literature. Personnel Psychology, 67:1, 241–293.